Unleash your dark and brooding personality with this rich fragrance for men. 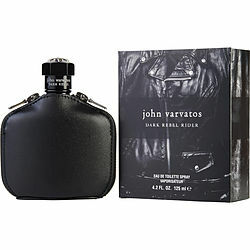 Dark Rebel Rider, launched in 2016 by John Varvatos, evokes a dramatic aroma infused with bitter orange citrus notes and saffron, offering a sour twist. This signature fragrance for the man who knows what he wants blends middle notes of orris and black violet, stemming from raw roots that radiate a hint of nature. A woody finish of Russian leather portrays your rugged style in this refreshing scent that lingers throughout the day. I'm absolutely enjoying this amazing scent with my personal chemistry - great, subtle presence. A definitive winner.